Exporter of a wide range of products which include meter bridge or wheatstone bridge with pencil jockey, spare pencil jockey, spare lead, fixed voltage stabilized power supply, dial type resistance box (two dial economy model) and portable wheatstone bridge. The four-gap bridge has a large and heavy copper strip of mounted on a heavy 3/4” thick laminated base of size 45” x 4” x 3/4”. Nine heavy Brass terminals lock type are provided to reduce the resistance to a minimum. The ends gaps are closed by removable Copper Binding pieces which are held in position by the terminals. The 24 SWG constantan wire is stretched along the top of wooden meter scale and securely clamped to the Brass end strips so that end errors are negligible.Supplied complete with pencil jockey along with lead for connections. Includes detail working manual. Overall dimensions: 1.12m × 100mm × 50mm, including terminals. 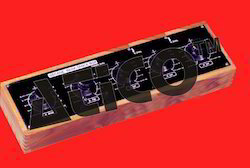 Ideal for Wheatstone Bridge and all types of Potentiometers, bakelite moulded handle, brass plated contact and with a locating notch. A heavy lock type brass plated terminal is provided for connection with Lead. The shape of the jockey is large (different from the one available in the market) and easy to handle. Supplied without lead. 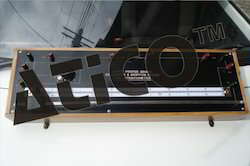 To connect pencil jockey with potentiometer and Wheatstone Bridge, a heavy wire lead of length 1.5 meter with U-shape brass clips connected at both the ends of the wire is provided. 2V, 200mA, Fixed Voltage stabilized power supply. Excellent quality for all types of Meter Bridge experiments. Supplied with leads. 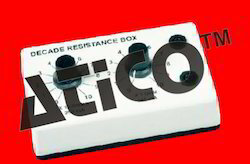 This type of Decade Resistance Box is particularly good for use with Wheatstone Bridges. It consists of high stability . Carbon metal film resistance of 1 Watt having accuracy of + 1%. This Bridge is fully portable with a built in sensitive Galvanometer and a dry battery. Range Multipliers:A single rotary switch furnishes 7 range multipliers of X1000, X100, X10, X1, X0.1, X0.01 and X0.001. Range of measurement :0.001 ohm & 11.1 mega ohm. Battery:A built-in dry battery of 4.5 volts. There is a provision for using external battery for measuring high resistances. 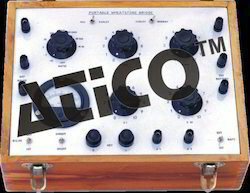 Galvanometer:Galvanometer of Model MO 65 with sensitivity 10 microamperes/ div. is used. Push Buttons:Two push buttons for battery and galvanometer are provided. 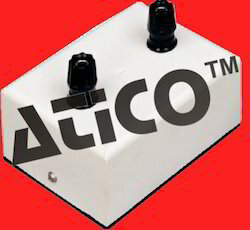 Accuracy:Both series and ratio coils are adjusted to an accuracy of better than 0.05%. Overall Accuracy of measurements is better than ±0.1%. a- Constantan Coil Accuracy ±0.1%. b- Manganin Coil Accuracy ±0.02%. 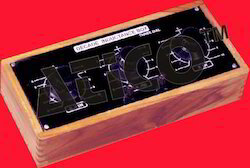 Specification of this Portable Wheatstone Bridge is equivalent to except resistance dials are made of 1% metal film, carbon resistance instead of Constantan or Manganin Coil. Rest all the features like series arm (4 decades), range multipliers (7 ranges), Battery, Push Buttons & Galvanometers . • A circular slide wire is calibrated from 0.01 to 10 ohms A rotary dial furnishes six multipliers of 0.1, 1, 10, 100 & 1000 & 10000. • Terminals for supply and head phone/detectors are provided on the panel. A detector key is also provided. The position of slider is adjusted to the position of minimum sound or position of minimum A.C. signals. • Accuracy of measurement ±1% at mid scale & ±2% overall. 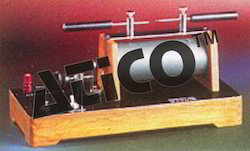 Hamburger Coil with platinum electrode for use with Kohlrausch Conductivity bridge, Dip Type. The ratio arm is in two dials of 1, 10, 100 and 1000 ohm each. 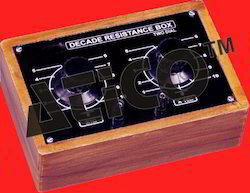 The resistance arm is in three dials having decade of 0.1, 1 and 10. A slide having 0.17ohm resistance is connected in series with unknown L. The slide wire is calibrated into 170 equal parts for easy calculation. A special double key is fitted to bridge. The key is internally connected with terminal for connecting battery and Galvanometer. 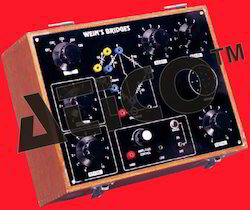 The bridge can also be used as an Wheatstone bridge. Standard Resistance : There are 10 coils of .01 ohm each arranged on a rotary dial plus a circular slide wire of total resistance .01 ohm and 500 sub-divisions is equal to .00002ohms on the normal range. Multiplying Ratios: A single rotary switch furnishes 5 multiplying ratios of x100, x10, ×1, ×.01 and 0.1. Range of Measurement :The bridge has a range of 2 micro ohm to 11 ohm. Panel :A bakelite panel enclosed in a teak wood box is used. Separate current and potential terminals, battery and galvanometer terminals, push buttons for battery and galvanometer are provided on the panel. Max. Current :10A intermittently & 5 A continuously. Coils :Managanin Coils are used. This bridge is very suitable for the use of wires & cable manufacturers. 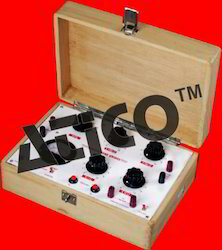 It is being extensively used for finding the resitance of transformer winding, contact resistance of relays etc. 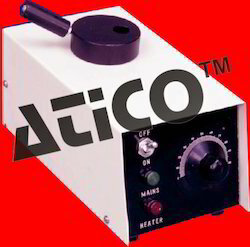 The unit is mains operated and can deliver a continuously adjustable D.C. Current of 0-10 Amp maximum. The unit consist of a variac, a step down transformer, a bridge rectifier, filter circuit and an ammeter of 0-10A to read current. Two heavy brass terminals are provided for output. 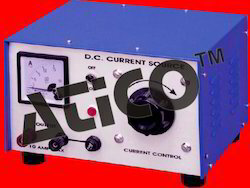 D.C. Output :Approximate 0-10V, Continuously adjusted to give a variable current of 0-10Amp depending upon external load. 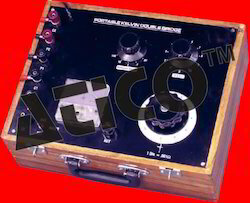 Ratio Dial :The instrument consist of one Ratio dial having multiplying range of 100, 10, 1 & 0.01. 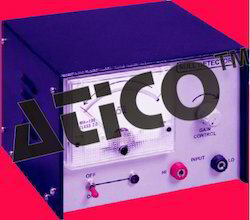 Galvanometer :Inbuilt galvanometer is fitted with in the instrument Terminal g1 & g2 are provided for connecting external Galvanometer-A selector switch is provided to select either inbuilt or external Galvanometer. Hot (water, mustard oil or Silicon oil) is essential to most electrical & electronic Instruments . Supplied with 100 ml Borosilicate Glass Beaker to place in Brass Reservoir in the special water bath. Whenever hot water or oil is required that can be heated by pouring water or oil in the said beaker. Very useful for so many experiments in the electrical sections. Copper Constantan mounted on a superior quality bakelite strip. With two terminals & mounted on stand. Three in one - Carry's Foster Bridge, Potentiometer & Callender & Griffith’s Bridge. It is an improvement over the potentiometer. The 50cm long slide wire of 1ohm resistance is calibrated into 100 equal parts. 14 coils are arranged in series in dials from each being of 1 ohm resistance terminals arranged for appropriate working of different instruments. Jockey slides on brass rod. This thermometer comprises a length of fine platinum wire of about 2.8 ohms resistance wound non inductively on a mica frame & soldered to stout copper leads. A pair of compensating leads are provided. All four leads being connected to terminals mounted on a suitably engraved insulating panel,which is joined to the mica resistance frame by cork mount on to which is fitted a stainless tube. 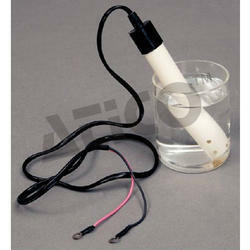 Since connections are soft soldered, this resistance thermometer is suitable for temperature work. Packed in velvet lined case. Anderson Bridge is used to measure unknown value of Inductance. The instrument has following inbuilt parts fitted in a Teak Wood case. 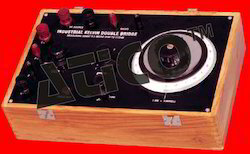 AC Source :The Bridge consist of sine wave signal of 1KHZ. The Amplitude of AC switch indicating lamp is provided on the bakelite board. Two sockets are provided for the output of AC signals. 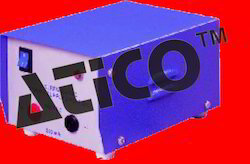 Detector :For detecting small AC signals in the output, Null Detector is in-built with digital display. Circuit Diagram :The circuit layout on the board is quite spread out to facilitate convenient working & clear understanding. 4mm socket are provided for making connections. Unknown Value: Four unknown values are supplied with instrument. R1 :Three decade dial of x1, x10 and x100 ohms. C :Decade dial of x 0.01 mfd. R2 R3 R4 :Fixed 1Kohm. The Wein’s bridge is used to measure the unknown value of capacity. 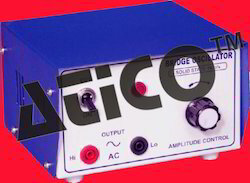 AC Source:The Bridge consist of sine wave signal of 1KHZ. The Amplitude of AC switch indicating lamp is provided on the bakelite board. Two sockets are provided for the output of AC signals. Detector:For detecting small AC signals in the output, Null Detector is in-built with digital display (optional - sometime Digital null detector is replaced by small speaker). Circuit Diagram :The circuit layout on the board is quite spread out to facilitate convenient working & clear understanding. 4mm socket are provided for making connection. 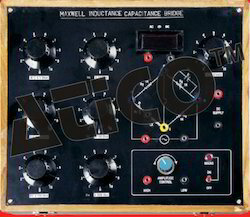 Unknown value :Five unknown values are provided on the panel selected by a Rotary Switch. R2 :Two decade dial of x10, and x 100 are provided on the panel. R1, R3 and R4 :Decade dial of x100 is provided on the panel. 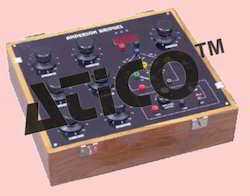 This bridge has been designed to calculate the unknown value of frequency of Bridge Oscillator. Circuit Diagram:The circuit layout on the board is quite spread out to facilitate convenient working & clear understanding. 4mm socket are provided for making connection. C1, C2 :Decade dial of 0.1mfd. R1 R2 :Are mechanically coupled x10, x100, x1000 ohms. 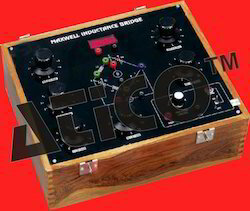 Maxwell’s Bridge is used to measure the unknown value of Inductance. The instrument has following inbuilt parts fitted in teak wood case. Unknown Value :Four unknown values are supplied with instrument. R4, R3 :Two Decade dial of x10 and x100 ohms. R2 :Decade dial of x1 ohm. Unknown Value :Four unknown value are supplied with instrument. R2, R3 :Fixed 1K ohms. R1 :Decade dial of x1, x10, x100 ohms. R4 :Decade dial of x10, x100, x1000 ohms. C4 :Decade dial of x0.01 mfd. Owen’s Bridge is used to measure the Unknown value of Inductance. The instrument has following inbuilt parts fitted in a Teak Wood Case. R3 :Decade dial of X10, x100 and x1000 ohms. C3, C4 :Decade dial of x0.1 mfd. R2 :Decade dial of x100 ohms. R1 :Internally fixed 1000 ohms. 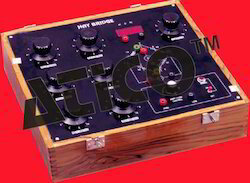 Hay’s bridge is used to measure the unknown value of Inductance. The instrument has following inbuilt parts fitted in a Teak wood case. Circuit Diagram:The circuit layout on the board is quite spread out to facilitate convenient working & clear understanding. 4mm socket are provided for making connections. Unknown Value:4 unknown value are supplied with instrument. 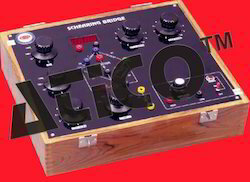 Schering Bridge is used to measure the unknown value of Capacitance. The instrument has following inbuilt parts fitted in Teak Wood Case. Unknown Value:Five unknown value are provided on the board selected by a Rotary switch. R1 R2 :Ratio Dial having step of 1, 10, 100 and 1000 Ohms. r:Decade dial of x1 ohms. C1Two Decade dial of x0.001 mfd & x0.01mfd. C2Internally fixed of value 0.001mfd. Using operational amplifier, Wein Bridge oscillator for better stability. 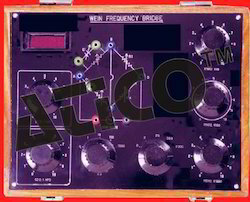 It provides pure sine wave 0-10 volt R.M.S. 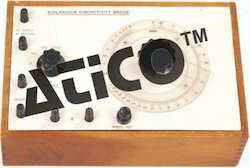 continuously variable output, giving fixed frequency 1KHz. 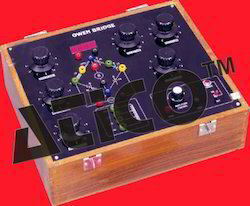 This bridge oscillator is used in almost all the four arm bridges. 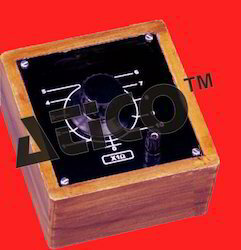 The Null Detector comprises a solid state amplifier having output stage with meter Indication. 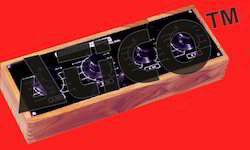 The instrument is supplied in metal cabinet with Duco Paint & Aluminium front panel. 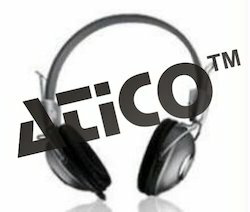 The said detector has been designed for use with AC Bridges (replaceable of headphone). High quality silver mica, paper polyester and metal film condenser are mounted on the Plastic plate fitted in a steel turf Non ABS Plastic. Two 4 mm socket terminals are provided. Working voltage 250 V for 0.01 mfd to 2 mfd capacitors and we use paper polyester capacitors upto this range. Working voltage 350 V for 5 mfd to 40 mfd capacitors and we use electrolytic capacitors up to this range. It consists of following parts. • One solid bakelite plate to be insert in gap of test capacitors. 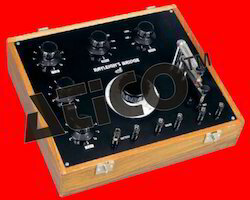 The air cored inductance coils are fitted in a steel turf bakelite case, elegantly finished. The frequency response is 1000 cycles/sec. Accuracy ±2.5%.. 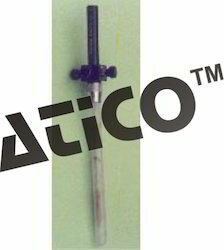 Flexible type, with high resistance receivers, fully adjustable according to head-size. For use with Kohlrausch Conducting Bridge. Looking for Meter Bridge and Various Type of Bridges ?